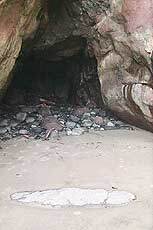 (Oregon Coast) - Discovering a real hidden spot on the beach, with nary another soul around, is one of life's real pleasures. There are few more ecstatic experiences than stumbling upon a stretch of sand, tucked away behind some brush or squeezed between a couple minor headlands, and finding yourself completely alone. 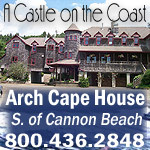 Unlike many travel destinations, this is something you’re a little more apt to find on Oregon’s coast. In many places, it’s one big hidden spot during most times of the year. But as spring break approaches and the weather improves on this often atmospherically temperamental area, even these beaches fill up a bit - almost as heavily and quickly as the motel rooms. Still, deserted beaches abound. You just have to look a little harder during busier times of the year. Here are a few spots that are characteristic of the pristine Oregon coast; spots the average tourist will find nothing short of remarkable. South of Yachats, and just barely south of Strawberry Hill and Neptune State Park, you'll find this almost mystical spot. More tide pools populate this obscure but fascinating place than humans. They really emerge at lower tides, clinging to odd, mushroom-shaped rocky blobs at the southern end. At this end, there's also a small sea cave and a huge boulder that together create a sort of arch by leaning up against the cliffs here. At the north end, you'll find plenty of mussels - but you'll have to cross the creek to do so. 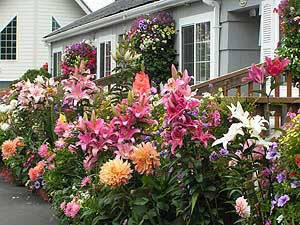 During the winter that's difficult, if not impossible and certainly unwise. During the summer months, it's much easier. These sands, along one of the Oregon coast's more popular hotspots, are usually smothered with people. But there are some parts that are less populated, like the very northern end, near the southern face of the cliffs of Ecola State Park. It takes some walking, but that's why you'll find less folks there. These basalt headlands are perhaps half a mile from the nearest beach access, which lies at the end of a private neighborhood at the end of 5th St. You can, however, reach it by a much longer walk from the last access downtown - from the park. 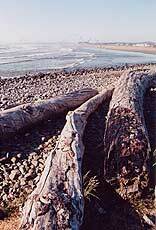 On the other side of that basalt structure lays an even more hidden beach: Crescent Beach. 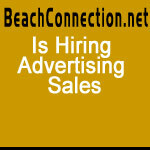 There, you'll find a large half-moon of a beach, cut off from any access but a one mile-plus hike. Pristine sands surround you, with almost never a human being there. As if designed by God to be a centerpiece, a sizable, monolithic sandstone sits practically in the middle. It's only accessible via a hike from the road that takes you to Ecola State Park, which begins at the private neighborhood. You can't park here: you'll have to park a ways away and hike the road to the beginning of the hiking trail. 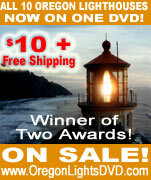 Look for Vista St. along the northern part of Depoe Bay, and follow that to a secret headland. Long stretches of basalt cliffs are the attraction here - some parts are smooth with odd patterns, while the rest is mostly craggy, pointy structures. The northern end has a strange, railroad-like shape, with incredible views of some wild coves. Other areas seem to form natural seats, perfect for sitting and viewing the crazed tide. There's a spot that's sunken and slightly flat, like the remnants of a basement - and a stairway-like structure formed naturally - rather ironic and miraculous. Walk just a little bit and it won't take long to notice you can often feel the tide shake and rattle these rocks ever so slightly. Meander to the south and the rocks take on a smoother and more colorful texture, with a long arm-sort-of-rock structure stretching out into the sea. Often, fishermen can be seen on these rocky shelves so close to the ocean. 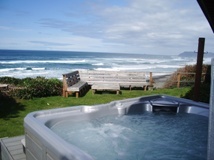 From here, you can glimpse a different view of Depoe Bay and see what it looks like from out to sea. At the southern end of this North Coast town, the beaches get less populated - except by rocks. Larger cobblestones begin to cover the sand, and the beach gets a little rougher. 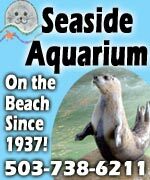 At one time - as you'll notice from various historical photographs - most of Seaside's beach was comprised of large stones and fine sand. Presently, it's covered only with sand and dunes to the north. The face of the beach was changed by the construction of the jetties at Astoria to the north, which altered the tidal action in the area and thus the distribution of sand. Now, the southern end is a bit like walking into the town's past. 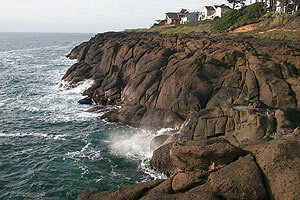 If you continue heading south, you'll run into the "Cove" - up against the bottom of Tillamook Head. 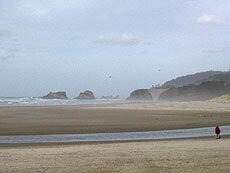 (It was somewhere on this north face that part of Lewis and Clark's troupe climbed to get to what is now Cannon Beach.) Or, take Avenue U for a nice little beachside drive past interesting, old cottages and motels, and watch the beach change from polished rocks to even larger, bulkier cobblestones. 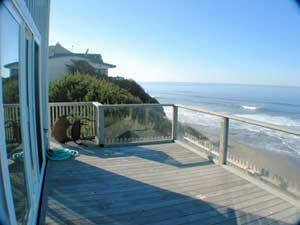 It ends up at the "Cove," which is a surfer's paradise. An interesting, if not slightly disturbing, little known fact about this area is that much of didn't exist before the '80s. 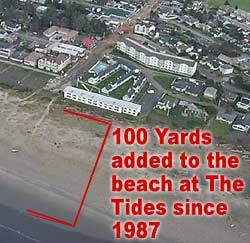 The tide line by The Tides lodging complex is now about 100 yards from the building, but before the 80's it was relatively close. 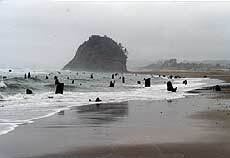 After an enormous landslide on Tillamook Head, loads of rocks from the headland wound up adding considerable width to the beach, even forming a small jetty for a while, which later turned into a massive pool of dead water. After a few years, that was filled in and hundreds of feet were added to the beach in some places at the southern end. Just south of Pacific City, Neskowin is the quiet little resort that's constantly threatening to explode into something much bigger. Walk further beyond the rock and you'll definitely be more alone. Along the way, note the stumps at the tideline, 2000-or-so-year-old remnants of something rather ominous. Somewhere in the last couple thousand years, it's believed an enormous earthquake caused a chunk of forest to abruptly drop some six feet into the surf. The result was the salt water preserved them instead of allowing them to decay in normal ways. Later theories, however, postulate that it was a slower process that had something to do with higher sea levels and encroaching sand dunes. For a real Gilligan's Island experience, head to the northern end of Neskowin, via a rarely traveled back road that goes on for almost a mile. There are a couple of hidden accesses spaced about a half mile apart. It's hard to get more hidden than this. Just a few miles north of Neskowin, another unassuming sign declares Winema Road. Follow that to the bottom and a tract of sandy beach that nearly no one knows about. There's another blob of a rock structure that looks a bit like Neskowin's Proposal Rock to the north, which features a flat stretch at the top that's perfect for lounging. 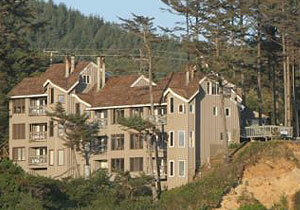 The cliffs soar high and become a striking gold, with some awe-inspiring homes up top. After about a mile or so, the beach ends abruptly at the southern end of Nestucca Bay, allowing you an unusual glimpse of the area.